AUSTIN, Texas, December 6, 2010 (ENS) – Coal tar pavement sealant – the black, shiny substance sprayed or painted on parking lots, driveways, and playgrounds – is the largest source of cancer-causing polycyclic aromatic hydrocarbons, PAHs, found in 40 urban lakes studied by the U.S. Geological Survey. PAHs are a group of organic compounds that occur naturally in crude oil, coal, and tar, and are produced by the incomplete combustion of fossil fuels, wood, grass, tobacco. They are widely distributed in the environment and are of concern because they are toxic, mutagenic, and can disturb the growth and development of an embryo or fetus. Van Metre says PAHs are an environmental health concern because several are probable human carcinogens, they are toxic to fish and other aquatic life, and their concentrations have been increasing in urban lakes since at least the 1960s. For this study, Van Metre and his USGS colleague Barbara Mahler evaluated the contribution of PAHs from many different sources to 40 lakes in cities from Anchorage, Alaska to Orlando, Florida. The USGS scientists collected sediment cores from the lakes, analyzed the cores for PAHs, and determined the contribution of PAHs from the different sources using a chemical mass-balance model. Coal tar is made up of at least 50 percent PAHs. Pavement sealants that contain coal tar have high levels of PAHs compared to other PAH sources such as vehicle emissions, used motor oil, and tire particles. The USGS scientists also tested for other PAH sources such as wood combustion and fuel-oil combustion. They found that on average, coal tar sealcoat accounted for one-half of all PAHs in the lakes, while vehicle-related sources accounted for about one-quarter. Lakes with a large contribution of PAHs from sealcoat tended to have high PAH concentrations, in many cases at levels that can be harmful to aquatic life, the study showed. Analysis of historical trends in PAH sources to a subset of the lakes indicates that sealcoat use since the 1960s is the primary cause of increases in PAH concentrations, said Van Metre. “Small particles of sealcoat are worn off of the surface relatively rapidly, especially in areas of high traffic, and are transported from parking lots and driveways to streams and lakes by storm runoff,” said Van Metre. The City of Austin banned the sale and use of coal tar containing pavement sealants in the city as of January 1, 2006. The ban came after City of Austin and USGS scientists identified coal tar pavement sealants as a significant source of PAH contamination in Austin area stream sediments. The City of Austin estimates that before a ban on use of coal tar sealcoat, about 600,000 gallons of sealcoat were applied every year in the city. 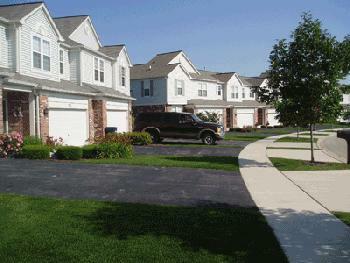 Sealcoat products are widely used across the United States, both commercially and by homeowners. The products are commonly applied to commercial parking lots in strip malls, schools, churches and shopping centers, residential driveways, apartment complexes and playgrounds. Manufacturers recommend resealing surfaces every three to five years. Runoff is not the only path by which PAHs are leaving parking lots. Another USGS study published earlier this year found that use of coal tar sealcoat on parking lots was associated with elevated concentrations of PAHs in house dust. Two kinds of sealcoat products are widely used – one based on a coal tar emulsion and the other based on an asphalt emulsion. The coal tar products have PAH levels about 1,000 times higher than the asphalt products. Dust from pavement with coal tar sealcoat has PAH concentrations “hundreds to thousands of times higher” than dust from pavement with no sealcoat or with asphalt-based sealcoat, the study found. Consumers can determine whether a product contains coal tar by reading the label or asking the company hired to do the pavement application. Van Metre points to previous research suggesting that asphalt sealcoat is more commonly used on the West Coast and coal tar sealcoat is more commonly used in the Midwest, the South, and the East. The results of the lake study reflect this east-west difference. For example, sealcoat contributes over 80 percent of PAHs in Lake Anne, Virginia, and PAH concentrations there are about 20 times higher than in Decker Lake, Utah, even though the areas have similar population density and level of urban development. PAH levels in pavement dust from sealcoated parking lots in Virginia are about 1,000 times higher than those from sealed parking lots in Utah, the USGS researchers found.